Last year I reviewed the first book in this series – CHASE TINKER AND THE HOUSE OF MAGIC. Chase Tinker returns (thank goodness) because many questions remained at the end of the first book. Chase is thirteen and his brother, Andy, ten. Both are still getting used to the magic each of them have had since turning 10 1/2 years old. They soon find more secrets and mysteries in their grandfather’s magical house, providing a different and dangerous direction in their pursuit to understand. There are new characters and major changes for many of the established cast. It all leads to a thrilling change in setting as they travel to England in an effort to rescue their cousin. In a normal world this would be quite violent, and although parts of this certainly is, it’s handled in a magical way perfect for MG eyes. If you haven’t read the first book could you begin here? I believe so. The author does a nice job of filling in the details along the way of the major events in the first story. You would miss out though on the magical set-up for what lies ahead. This second book has a more satisfying ending and we know much more about the Tinker’s and the dreaded Marlowe family. It’s bound to be another clash between these two in Book Three, CHASE TINKER AND THE HOUSE OF DESTINY. FULL PLOT : In Chase Tinker’s world, magic, lies and secrets can be a lethal combination… After spending the summer at his grandfather’s gigantic, incredibly magical house, thirteen-year-old Chase Tinker thought things couldn’t get any more bizarre, or that the secrets and lies couldn’t get any worse, but he was wrong. As summer turns into Autumn, join Chase and his family for even more magical craziness in this exciting sequel to Chase Tinker and the House of Magic. Craziness that will include: the sneezing of strange powers, the reappearance of the evil Marlowe family, another frightening kidnapping, the discovery of a mysterious, magical Japanese-American girl, a dangerous rescue mission, and a secret so mind-boggling, it will lead to a shocking climatic finish that will turn Chase’s world completely upside down and leave him feeling like one of the worst people on the planet. Chase’s telekinesis ability allows him to teleport to any location, and he can also make objects too distant to reach instantly arrive at his side. Many fun and surprising uses of this ability. Persephone is the female lead who brings a nice balance to siblings Chase and Andy. She is strong in thoughts and in her ability to see the big picture. Chase is your typical 13-year-old boy if there is such a thing. He does differ from other teens in a few ways. His newfound magic abilities, an unsteady relationship with his father, and the bravery he needs to face the dreaded Marlowes make him a unique and endearing MC. I didn’t expect that one coming is something that came to mind in many chapters. The final twist at the end surprised me like no other. Excellent story telling. The subject of secrets. How do they hurt others when you keep something to yourself? A perfect theme for discussion in classrooms. AUTHOR QUOTE: I’ve always wanted to have the ability to teleport and the power to move things around with my mind. Then one night I dreamt I was living in a house filled with magical rooms and the very next day I started putting together ideas for my Chase Tinker fantasy series, after consulting with my kids, of course. For more see Malia’s author web site. Make a comment if you have time. I enjoy reading all of them. You’ll find the comment link below. 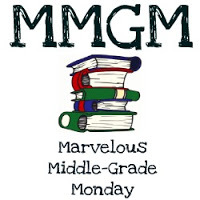 This entry was posted in Reviews and tagged Chase Tinker series, male protagonists, Malia Ann Haberman, Marvelous Middle Grade Monday, MG book reviews, Middle grade. Bookmark the permalink. I’ve seen this book at my library but I’ve never checked it out – but now I will! Thanks so much for the review! That’s awesome it had such a great twist. I sounds like a great series. Any middle grade with magic involved is mine! I love reading this kind of story and sharing it with young readers. sneezing of strange powers – I have to check that out! Love the idea of a magic house. And I laughed out loud at the quote about eyes in the back of his head. This sounds like a book my sons would love. I’m definitely intrigued by the travel to England and the satisfying ending. This sounds really good. I’ll be tracking down this series for a family trip this spring. Oh, this sounds like an excellent series. The character remind me a bit of three-some in the Potter series. I love being caught completely off-guard with an ending. Gee, these sound like awfully fun books. I will have to check them out. Thanks for the very thorough review. I’m such a sucker for titles and this one totally grabbed me. Thanks so much for sharing your thoughts!